Dallas Cowboys quarterback Tony Romo (9) reacts after throwing an interception in the fourth quarter against the Green Bay Packers at AT&T Stadium. 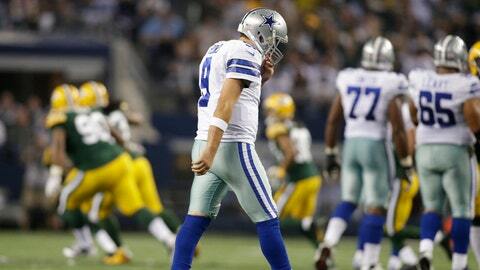 Packers beat the Cowboys 37-36. Tony Romo suffered another relapse Sunday in his addiction to adversity. After the collapse against the Packers, even the most ardent Romo supporter has to admit the guy has a problem. That problem is his habit of throwing interceptions in the clutch. This time Romo threw two interceptions in the fourth quarter of a 37-36 loss, a game the Cowboys led 26-3 at halftime. He had a third potential pick overruled by replay. But don’t expect Romo to stand up at a Chokers Anonymous meeting and say, "Hi, my name is Tony. And I have an interception problem." It could never get to that point because first there would need to be an intervention, and Romo is surrounded by too many enablers for that to happen. It begins, of course, at the top with Jerry Jones who continues to throw his support, both monetary and managerial, behind Romo. He can do no wrong in Jerry’s eyes and the rest of Valley Ranch has gotten the message. That invulnerability leads to messes like Sunday’s Yes, Romo was terrible in the clutch, but he had a lot of help getting there. It starts with another sorry defensive performance. The Cowboys tried a couple of news things on defense: playing Sterling Moore at cornerback, mixing in a corner blitz. But another linebacker, Justin Durant, went out with yet another hamstring injury. That’s why, even with a 26-3 halftime lead, the coaching staff felt compelled to continue to attack. They couldn’t trust the defense to hold a lead, even against the Matt Flynn-led Packers. DeMarco Murray had rushed for 93 yards on 11 carries in the first half. Naturally, you’d want to shorten the game and limit turnover opportunities by feeding the ball to Murray in the second half. Not the Romo enablers. With Bill Callahan calling plays under the watch of head coach Jason Garrett, Murray got seven carries in the second half. He got just three in the critical fourth quarter. Instead, the braintrust put the game into the hands of Romo. That’s not a bad option when trailing, but it’s tempting disaster when trying to protect a lead. "At different times in the second half we probably could have run the ball more, but we were having some success throwing it," Garrett said. "We wanted to maintain an aggressive mentality throughout the ballgame and we wanted to mix run and pass." One of Romo’s greatest strengths is he extends plays that would otherwise be dead. That’s also his greatest weakness. In the fog of battle, he forgets the big picture and instinctively tries to make plays. That’s what happened on Romo’s first interception, when Green Bay’s Sam Shields cut underneath Miles Austin to make the pick with 2:50 left. On a designed run play, Romo saw that the Packers’ defense was overloaded to the side where the Cowboys intended to run. That left Austin in one-on-one coverage. So Romo optioned to a pass on second-and-six from his own 35 while trying to protect a five-point lead. "That specific time, obviously when I look back now, we should’ve run the ball because you throw an interception," Romo said. "You shouldn’t ever give them a chance to recover the ball. We’ll get better – I’ve got to do better than that. It’s tough." The play was made because Romo felt a little pressure from the defensive end and allowed his instincts to take over. "It was my fault, obviously, for putting the ball in a position where the defense could come back and make a play," Romo said. Or was it Garrett’s fault for not putting the shackles on Romo in that situation? Garrett was quick to admit to reporters that the play was originally a run call. Some would say that’s Garrett making a player accountable for his decision. Ultimately, Garrett is responsible for what Romo does. He should know his quarterback better than anyone. Pointing out Romo’s mistake after the fact doesn’t win games. The second, crushing interception was not Romo’s fault. At least not completely. Having lost the lead with 1:20 left, Romo threw a ball into the right flat, just your typically sideline route in a two-minute offense. Except receiver Cole Beasley cut the route short and watched Romo’s pass sail wide of him toward the sideline. The ball had just enough on it to allow Green Bay’s Tramon Williams, who was playing soft coverage, to make a diving interception. This time replay couldn’t save Romo, although he tried to snap the ball before the original call of an incompletion could be overturned. Beasley owned up to his mistake. "I saw the cornerback and I throttled down a little bit," Beasley said. "I don’t have the option to do that on that play. That was my fault." Romo backed up that assessment. "He ended up cutting his route off and I threw it as if he was continuing to go to the sideline," Romo said. There’s no statistic kept for interceptions caused by receivers running the wrong route. If there were, Romo might lead the NFL in that category. But what’s it matter if another clutch-time interception goes on Romo’s record when so many around him seem content to let it happen?